Important! Due to construction at Mountain View Shelter the Pirate Booty Run has been moved to Shinzen Activity Area! Park entrance fee has been paid by the event! Join us for the 5th Annual Pirate’s of the Cure-i-bbean 5K Booty Run to help promote awareness of blood related cancers thru Relay for life team member’s fund raising efforts. Participants receive Finisher Pirate Medallion, shirt with map and a chance at the Pirates Treasure Chest. Dress in your best pirate garb and run for the booty. Walkers and strollers welcome. Special $25 pricing for kids 9 and under – Discount taken automatically during registration. All donations support the American Cancer Societies Relay for Life Team! No shirt size exchange during packet pickup. However, we will exchange after event. Event takes place rain or shine. Dress in your favorite Pirate garb and be entered in the Pirate Costume contest. Last year’s winner really played the part! This is a fun part of the Pirate Booty Run where participants dress in their best pirate garb and compete to win the prize. We also have a largest team award. Create a team name and have your pirate friends join your team! Hear ye all Mattes… 2019 booty will be raised to a value of $1,500! All Hearties will be eligible to win. Avast ye! Every Scallyway is eligible to become the winner of the Pirates Chest. There will be a drawing for 5 small treasure chests, each with a key and other goodies. One of those keys will open the Pirate’s Treasure Chest and that winner will receive all the booty inside! The other 5 small chests will be packed with booty as well. 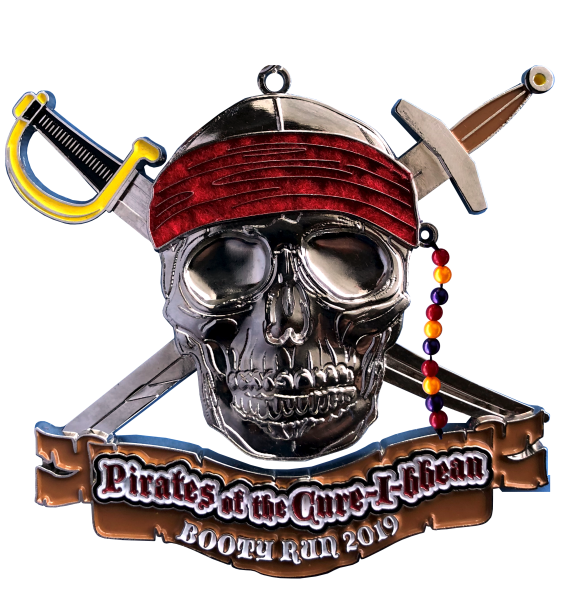 Check out our 2019 Pirates of the Cure-i-bbean Booty Run medallion! The Pirate Booty Run is the first run in our Winter Classic Medal Series. After earning this medal register for the Chocolicious 15/5k, Support Blue and St. Patrick’s Day run to round out the series and earn a miniature of each medal and a lanyard to display them on! (To be given at the St. Patrick’s Day Run).